Clearly identify every lizard you trap. Even very small lizards may grow to become quite large and dangerous to people. Some lizards can carry diseases that can be harmful to humans-- especially children. Always supervise children with lizards. Spray your lizard with water and also provide a clean dish of water daily for it to drink. Ask your vet for specific guidance on what and how to feed the kind of lizard you have. More than 4,000 species of lizards exist and almost all of them are friendly toward humans. Lizards live on every continent except for Antarctica and it's quite common all around the world for people to keep lizards as pets. If you've ever wanted to have a lizard as a pet, the easiest way to do so is to catch your own lizard. By following these steps, you can learn how to make a lizard trap. Find a place that has signs of lizard traffic. Lizards like to live in areas that have a water source and a food source such as insects. Places that have a lot of leafy vegetation also attract lizards. Wash the glass aquarium completely with hot water. Don't use soap because lizards have a strong sense of smell and the chemicals in soap may be toxic to them. Fill the aquarium a quarter of the way with green grass and leaves. Place the aquarium in the place where you suspect lizards may live. Keeping it out of direct sunlight and as camouflaged as possible will help avoid scaring off lizards. Cover the top of the aquarium with a thin plastic wrap. Make sure all sides of the aquarium are wrapped so that a lizard can't crawl out. Cut a small slit in the middle of the plastic wrap. The slit should be about six inches long and not more than half an inch wide. Place lizard food on top of the plastic wrap right next to the slit. For lizard food, you can use anything from dead insects to live worms. The object is to attract the lizard to the top of the glass aquarium and have the lizard fall through the slit as it attempts to reach the food. Check the aquarium at least twice a day to see if you have trapped a lizard. Replace the lizard food as needed until you are successful. Take the lizard to your local pet shop for identification. This is an important final step because many types of lizards can be harmful to humans. For example, monitor lizards can grow to become more than six feet in length. These carnivorous lizards can become predators and have even been known to kill small children. With any type of lizard, children must understand that they are not toys but rather wild, living creatures that need to be handled with care. Find out how to care for pet lizards. 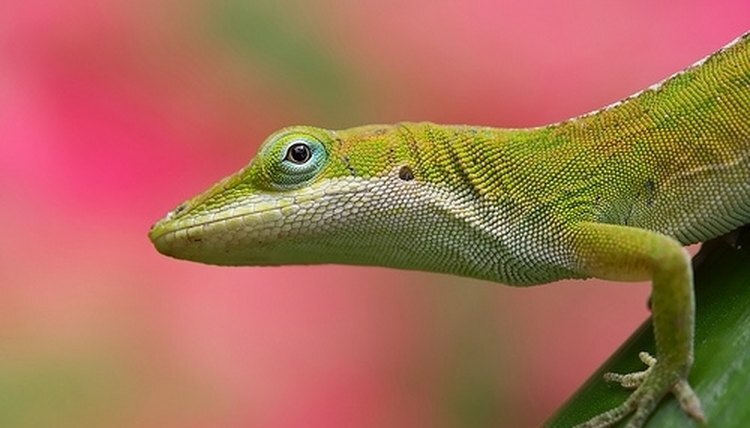 Learn more about lizards and lizard care.